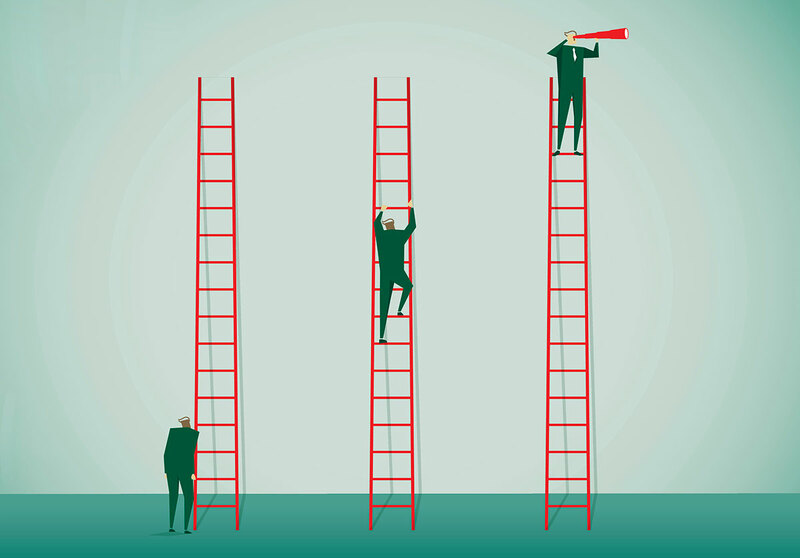 Unmotivated employees hinder the progress of hard-working, career-oriented achievers. Both groups need your attention to ensure a healthy work environment. You, as a leader, must identify and support the team members who are constantly climbing toward success. Imagine a bucket full of crabs that can clearly see the opening overhead. They topple and climb over each other as they try to scale the lip of the bucket and reach freedom. At the bottom are a few crabs that don’t want to make the climb. In fact, not only do they not want to climb, but they don’t want the other crabs to be successful either. These unmotivated crabs use their claws to grab the others, dragging them down. The counterproductive act impedes the progress of the freedom-seeking crabs. And, ultimately, this causes the motived crabs that were working so hard to succeed to give up and join their brethren at the bottom of the bucket. This phenomenon, documented in a 2015 study of crab behavior, is called crabs in a bucket syndrome, or CBS. The syndrome alludes to the behavior of a few unmotivated people in a group who are continually dragging down the people trying to find success. 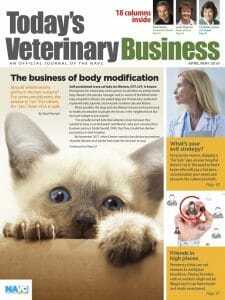 Does your veterinary practice suffer from CBS? As a leader, you have the choice to support the climbing crabs or pay attention to the unmotivated bottom-of-the-bucket crabs. Choosing where you focus will ultimately decide the fate of the whole bucket population. The first step is to identify the unmotivated crabs that inhibit the performance climb. Identify them before they cause the most motivated climbers to give up and either leave your practice or settle for a spot at the bottom. Utilize the suggestions listed in the table on Page 54 to improve performance and lessen the negative impact of the unmotivated crabs in your practice. The employee does not respect the importance of getting to work on time and sharing the workload with fellow associates. This indicates disinterest in professional knowledge and a lack of passion for the employee’s important role on a team providing medical care. This is a sign of someone who focuses more on disseminating unproductive communication than on the practice’s professional operation. Gossip is an indication of professional immaturity. This shows a lack of positive communication skills. Instead of proactively communicating with the intent of problem-solving, this associate would rather sever communication. This causes division in the office and sometimes leads to a hostile work environment. This associate threatens to quit to secure her desires. If enabled, the highly toxic behavior can cause a domino effect of ultimatums throughout the office. Your duty as a leader is to identify the unmotivated crabs. It is essential that you prevent them from sinking their claws into the climbers. 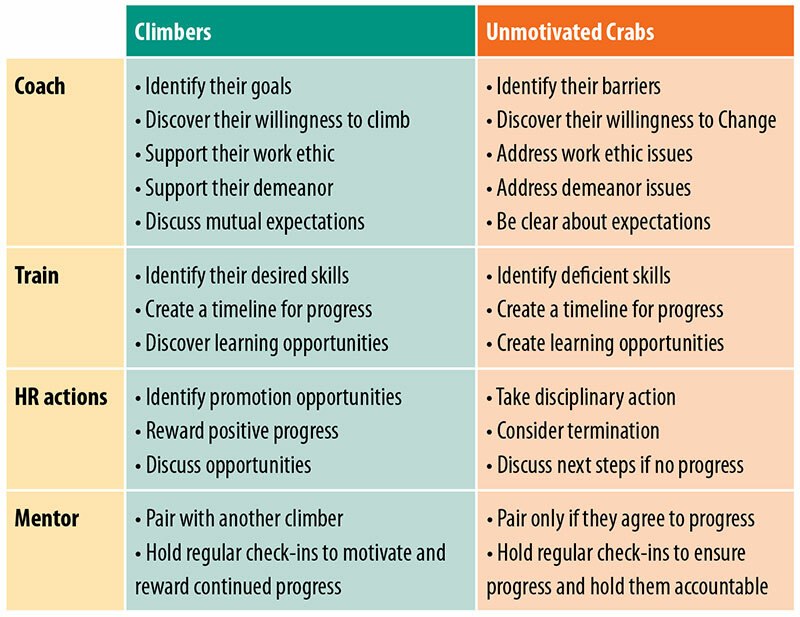 Which crabs are constantly climbing toward success? You, as a leader, must identify and support the climbers. They are always striving for more and are willing to endure struggles as they try to achieve their goals. Climbers will be motivated if they have the strength, endurance and support to continue climbing. Being pulled backward will deter and demotivate them. If restrained long enough, they might become as unmotivated as the bottom-dwelling crabs. As a leader, you need to identify the climbers in your practice and protect them on their journey using your leadership decisions and style. Following company policies shows a respectful demeanor that will have a positive ripple effect on the team’s performance. An associate who shows concern for a positive client and patient experience is someone you should embrace. A leader should encourage and protect this behavior. This is a sign of an associate who is willing to talk when times get tough. The skill will lead to conflict resolution and ultimately to the retention of clients, patients and other associates. A hunger for information shows a genuine passion for the veterinary field and professional growth. This valuable associate is willing to invest time into the growth necessary to provide excellent patient care. A climber is focused on success, not negative and unnecessary communication that doesn’t contribute to the team’s positive performance. An associate who stays away from gossip is extremely valuable in promoting a healthy work environment. Once you have identified the unmotivated crabs and the climbers, take control of the bucket. Here are some tips. Does your practice employ unmotivated crabs who potentially endanger the progress of your climbers? Take the appropriate actions so your practice can experience the success of the climb. Claire Pickens is a learning and operational development manager at Thrive Affordable Vet Care. She is a former practice owner and has over 20 years of experience in leadership and teaching.